The concerns over the oil leaking from the BP well in the Gulf are increasingly focusing on the amount of oil that is still leaking from the well, and the overall rate at which the well has been producing oil and gas in the past. It is now possible to view the site where the riser insertion tube (RIT) is drawing oil from the well. Clearly there is still a considerable amount of gas and oil escaping into the sea, despite BP now drawing some 5,000 bd up through the RIT. This has led BP to recognize that the spill is larger than had originally been estimated. (Note that there are live feeds from Senator Nelson’s office and the House both of which can be overloaded with demand. (They were when I just tried to get an illustrative frame.) This, instead, is a shot from a video of the remaining leak that is just above the BOP, and that is not currently addressed, but should also be stopped when the well is killed. Part of the problem remains in the complexity of the flow of an expanding gas in oil, coming out into an unconfined (apart from the sea pressure) space. Estimates of the flow have ranged up to 100,000 bd. At the moment the evaluation is relying largely on either visual evaluations, or relatively crude analysis, albeit with sophisticated systems, based on estimated behaviors of the flow volumes. Whether the flow has, as BP have stated, been significantly reduced by the RIT tap, or whether the current tap has had little significant effect is largely, at present left up to individual judgment without measurements of the actual flows. Unfortunately useful real information is not being provided in quite the open and transparent way that BP and the Unified Command had originally promised. 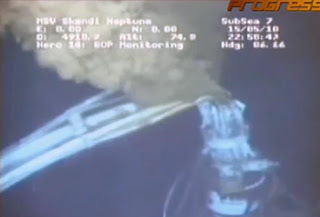 And, having watched the video of the flow intermittently this afternoon, it largely depended on where the ROV had positioned the camera as to how much gas was visible in the plume. Since BP are the ones getting much of the data, it is therefore not surprising that the Federal Government is beginning to lose patience with them over this situation. It may be, as BP have stated, that a higher proportion of the flow is natural gas, and that this distorts the evaluation at the mouth of the riser. However it is possible, based on other available measurements, including those established using the gamma ray survey equipment from Sandia, to get a ball-park estimate of the flow upstream of the riser end. It is disappointing that BP has chosen not to make that information public. Public anger at BP is continuing to build. The arrival of oil, both as crude and emulsion in the Gulf Shores is going to become significantly worse in the short term, and questions will likely turn to how this oil was able to circumvent the booms that have been put in place to contain it. • Personnel were quickly deployed and more than 24,000 are currently responding to protect the shoreline and wildlife. • More than 1,000 vessels are responding on site, including skimmers, tugs, barges, and recovery vessels to assist in containment and cleanup efforts—in addition to dozens of aircraft, remotely operated vehicles, and multiple mobile offshore drilling units. • More than 1.43 million feet of containment boom and 560,000 feet of sorbent boom have been deployed to contain the spill—and approximately 370,000 feet of containment boom and 1.28 million feet of sorbent boom are available. • Approximately 8.3 million gallons of an oil-water mix have been recovered. • Approximately 655,000 gallons of total dispersant have been deployed—600,000 on the surface and 55,000 subsea. More than 340,000 gallons are available. It is, perhaps a little surprising, seeing this effort that the oil has been able to bypass the barriers and to come ashore in the volumes that are being reported. Regardless of the outcome of the top kill try that will likely take place this weekend , the oil that has been released will be the center of public attention for the next few weeks. Public concern has already led EPA to change their mind over the use of the dispersant Corexit 9500 being injected into the flow underwater. (A selection previously approved by EPA, after testing both on the surface and with undersea release.) But if the kill works this weekend, that concern will go away, while the concerns over the quantity of the oil released and its effects on the beaches and marshes will become more of the headline. 1. Sampling of dispersant/oil and oil‐only waters must be continued per the Directive, and in addition, baseline data of waters without direct application of dispersant or oil shall also be collected by BP. Monitoring of subsurface dispersant application by BP shall be performed from a vessel capable of performing all requirements of the May 10, 2010, Dispersant Monitoring and Assessment Directive and Addendum 1 on each day that dispersant is applied. As used in this Addendum 2, a “day” shall mean a calendar day. 2. Within 24 hours of the issuance of this Addendum 2, BP shall identify to the FOSC and the EPA RRT Co‐chair for EPA’s and the FOSC’s approval, one or more approved dispersant products from the National Contingency Plan Product Schedule that are available in sufficient quantities, are as effective at dispersing the oil plume, and have a toxicity value less than or equal to 23.00 ppm LC50 toxicity value for Menidia or 18.00 ppm LC50 for Mysidopsis, as indicated on the NCP Product Schedule (http://www.epa.gov/oem/content/ncp/tox_tables.htm). The less toxic dispersant product(s) shall be used by BP for surface application and subsurface application as directed by the FOSC. Within 72 hours after submitting the list of alternatives, and after receiving EPA approval, BP shall immediately use only the approved alternative dispersant. I'd like to post a comment here about dispersants, the change of mind referred to in this thread's title. And since, HO, I know a little about you, let me reciprocate with a one sentence background about me. I've spent roughly 15 years in the Canadian equivalent of EPA, another 15 as a science manager in an oceanographic institute, and 10 running a small environmental consulting company. For readers to whom the term is a new one, the LC50 figures in your quote from EPA refer to the concentration that kills 50% of the test organisms in a bioassay, a number usually calculated from a 2-day or 4-day exposure. Menidia (a small fish) and Mysidopsis (a shrimp) are two of the organisms used in bioassays as the aquatic equivalent of laboratory rats. So we have EPA calling here for a less toxic dispersant, which has an LC50 to shrimp greater than 18 ppm. Death (LC50) is not the only relevant endpoint. Any dispersant, will increase the biological availability of the more toxic components of oil. This enhances not only lethality but also the probability of sublethal effects. One of the issues with dispersing oil at depth in the water column is that it's much more resistant to degradation there, and in the sediment, than it is exposed to air, nutrients and mixing at the surface. It's also inaccessible to cleanup efforts until it comes ashore, as some of it it will. Trapped in the water column, the lighter fractions of the oil dissolve and it's these lighter fractions that are the most toxic to marine life, with potential for a range of reproductive, carcinogenic and mutagenic effects. As dispersed oil degrades, its buoyancy slowly decreases and it should eventually sink or in other ways enter the sediment, unless it comes ashore first. Once oil (dispersed or not) enters the sediment, the rate of degradation slows dramatically as an adequate oxygen and nutrient supply becomes more of a problem. Storms are quite effective at moving sediment towards and onto the shore, so 'fresh' contamination from this incident can be expected onshore, mostly likely in the Eastern GOM, for years and years and years to come. The main vehicles for dispersant application in this incident have been aircraft and vessels. With aircraft, obtaining adequate mixing of the dispersant with the oil isn't possible; it’s even difficult with vessel application. For the aircraft applications, natural mixing though the action of wind and breaking waves is pretty much it; calm conditions make that mixing even less efficient. If the dispersed oil sinks before it drifts ashore, see above. If it doesn't, and I've seen news video of what looks to me a lot like dispersed oil in the marshes, well we're back to enhanced toxicity. As the saying goes, you pays your money and you makes your choices, none of which are consequence-free. I apologise for going on at length about this, but the comments I’ve read on TOD suggest to me that most readers here will be relatively unfamiliar with the questions surrounding dispersant use. Those interested in reading more about the complexity of the decision to apply or not to apply, could look at Oil Spill Dispersants: Efficacy and Effects, a 2005 publication of the National Academies, starting around page 39. In oversimplified terms, the decision is a tradeoff between protecting shoreline resources or protecting pelagic and benthic resources. In a blowout like this one, it's not a question so much of protecting the environment as it is of deciding which components of the environment you're more and less willing to see damaged. Interagency spill response groups go through periodic exercises to evaluate just what might be the preferred responses to almost every imaginable situation, allowing decisions to be made in situations like this more quickly when the time comes. And the decision is never made on the basis of science alone, no matter how much scientists like me like to argue the case. Thanks for this background, I suspect I will refer to it more once the emphasis shifts from killing the well to the cleanup.